UOA Holdings Sdn Bhd, a subsidiary of Australian Stock Exchange-listed UOA Ltd, aims to bring more positive changes to the local property market by focusing on niche projects that will add value to the living and working environment. Built on small parcels of land, its residential and commercial projects combine modern and contemporary elements with focus on good landscaping, natural lighting and spacious designs. Although UOA has often been mistaken as a unit of life and general insurer, United Oriental Assurance Bhd, the “perceived association” with the financial services group has come in handy during its initial early years when it was etching out a mark in the industry. Since its debut in the local property scene two decades ago, the company has completed a number of impressive and innovative residential and commercial projects in various parts of the city. It has to-date completed more than 3,000 residential and commercial properties worth a gross development value of close to RM2.5bil. In an interview with StarBizWeek, UOA general manager David Khor says the company’s projects have established UOA as a strategic and niche developer of quality projects in well sought after locations. “Although most of our projects are located on small parcels of an acre to 30 acres, they are in highly visible and strategic locations, and these factors have contributed to the projects’ success,” Khor says. Since starting out in Kuala Lumpur in 1989, UOA has not ventured out of prime real estate and well sought after locations – a hallmark of all its projects. Having such highly visible projects have also helped to establish UOA as a formidable name in Kuala Lumpur’s property scene. Most of its projects have quick turnaround time of between 1 1/2 to 2 1/2 years from land purchase to project launch and sales. “We do not want to overly extend ourselves by having too large a landbank that will incur very high holding cost. But we believe that it is good to have land in strategic locations such as around the Kuala Lumpur City Centre (KLCC) as prices have came off quite a bit due to the global financial crisis and should be on a recovery mode in the coming months,” Khor points out. Presently, it has a land bank of around 100 acres in various locations including Kepong, Taman Desa, Segambut and Bangsar. The company is keeping busy with its 60-acre Bangsar South integrated mixed development, located on the former Kerinchi squatter colony, off the Federal Highway. 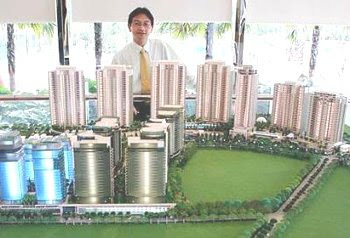 Khor says the company’s healthy financial position allows it to undertake projects under the build-then-sell (BTS) system with three residential projects – The Happy Garden, Villa Yarl and Halimahton projects, all located off Jalan Klang Lama – completed before they were launched for sale about two years ago. Its first boutique projects comprise Villa Mont’Kiara in Mont’Kiara and One Desa Residence in Taman Desa, off Jalan Klang Lama, that were completed five years ago, have further raised UOA’s profile in the local market. 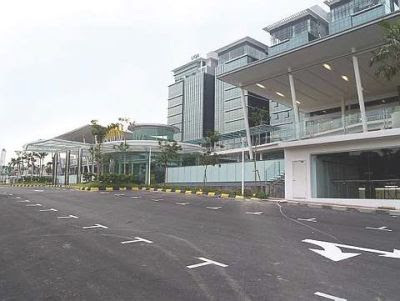 The company has also made a major foray in commercial properties, four of which have been injected into the UOA Real Estate Investment Trust (UOA REIT) that was listed on Bursa Malaysia in 2005. UOA Holdings and its subsidiary companies own 71% of UOA REIT. The REIT contributes approximately RM20mil to the UOA group’s bottomline annually. Khor says the performance of the REIT has been good. Since its listing three years ago, the trust’s assets have grown by over 50% to RM481mil through a combination of asset revaluation and acquisitions. Its asset portfolio comprise commercial parcels in UOA Centre (or UOA I) and UOA II, both located along Jalan Pinang and adjacent to the Kuala Lumpur City Centre (KLCC); UOA Damansara and UOA Pantai. Ong says the company’s commercial properties will be made available to UOA REIT for right of first refusal. The company’s other recently completed commercial projects include Menara UOA Bangsar and Wisma UOA Damansara II. A strong proponent of light structures and use of glass and stainless steel to create an elegant and spacious effect in its office buildings, Khor says UOA believes in adding value to its developments by giving more than the features specified in its project agreement with buyers. With its focused business plans and strategies, the company has enjoyed uninterrupted profit since 1991 and an annual average growth rate of 20%. “We are proud of all our development projects as they each have their own unique design themes and features that cater to their particular location and target buyers,” Khor notes. He says UOA is continuously seeking growth opportunities in its staple market of Kuala Lumpur and in other potential markets in other parts of the world. “In fact the group has been looking for overseas ventures over the past decade and we have concluded that Malaysia is still the most conducive and preferred market for our businesses at this juncture,” Khor adds. Villa Mont'Kiara is the first boutique project under UOA. UOA Holdings Sdn Bhd’s urban renewal initiatives of the Kerinchi squatter colony into an integrated mixed development called Bangsar South has taken off well with about a third of the commercial precinct currently under construction and two residential blocks completed to-date. The 60-acre development, located off the Federal Highway, kicked off in 2007 and will take around 10 years to complete. UOA general manager David Khor says Bangsar South will comprise 34 office blocks, one retail block, and seven residential blocks. This will translate into a total gross lettable space of 5 million sq ft of office space, 600,000 sq ft of retail space and more than 2,000 residential units for a total gross development value of RM2.5bil. So far the company has sold RM253mil worth of boutique office towers of 10 to 11 storeys to corporate buyers who will have the naming rights for the property. The residential properties were opened for sale since 2007 and so far 60% of the 470 units have been sold. The retail space on the three storey The Sphere boutique mall is only available for lease. So far, the company has sold eight office blocks worth a GDV of RM253mil and another six blocks have been completed. 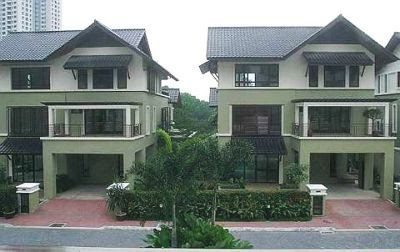 Two of the completed blocks have been rented out and another four blocks are available for en-bloc sale or rental. The selling price for the office space is around RM700 psf while the asking rental rate is RM4.50 psf. Khor says UOA has improved the infrastructure access between the residential and commercial precincts by widening the main road leading into the area into three lanes and upgraded the Putra LRT’s Universiti station. Pedestrian pavements and sheltered pavilions have also been built. According to him, Bangsar South projects will continue to be the main growth driver for the company over the medium to long term. “Going forward, the development in Bangsar South should remain the company’s focus as it will contribute positively to the company’s bottomline over the next seven to 10 years,” he adds. The company also has other on-going niche development projects in Taman Desa, Segambut, Bangsar and Kepong just to name a few. Its investment properties in both commercial and residential properties will continue to contribute stable investment income on an annual basis. “We anticipate both the commercial and residential components to be well balance in the future. Their contribution will largely depend on the demand and supply of properties in the coming years,” Khor says. Some RM400 million worth of luxury properties are expected to be sold by the end of the three-day iProperty.com Expo "Luxury Collection", which features high-end properties locally and abroad. About US$2 billion (RM7.08 billion) worth of luxury properties, award-wining townships and developments are being showcased by top local and foreign developers at the expo. iProperty.com chairman Patrick Grove said two properties have already been sold by a local developer in the morning the expo started. While Malaysia's property sector is not shielded from the global recession, he said, investors still see Malaysia as one of the cheapest in Asia to buy property. "This is a testament of the strong Malaysian property market and is also indicative that luxury real estate everywhere is still, undoubtedly, a hot commodity," he said at the launch of the expo by Housing and Local Government Minister Datuk Seri Kong Cho Ha in Kuala Lumpur yesterday. Also present was iProperty.com Group chief executive officer Ken Tsurumaru. The luxury property exhibition, which ends tomorrow, is organised by iProperty.com, a subsidiary of the iProperty.com Group, which owns and operates property and real estate website and property magazine. Grove said property prices in Malaysia's luxury segment have dropped between 10 per cent and 20 per cent since the start of the global economic crisis, while prices in the mass market have maintained or increased a little. "But there are some indications since last month that prices are picking up. "Traffic at our website shows that people are window-shopping but they have not made purchases yet," he said. Last month, the company's website, iProperty.com Malaysia, registered the highest traffic of one million, up from 900 in May and 800 in April. The average number of online visitors to its website last year was 750. "This indicates that people's confidence is returning," he said. This is the fifth year iProperty.com is organising the expo, which serves as an avenue for buyers and investors to expand their financial portfolio. Grove said some 15,000 high net-worth individuals and institutional buyers from local and internati onal markets are expected to visit this year's expo, which showcases award-winning properties and luxury townships by Malaysia's top developers in high-growth areas such as Kuala Lumpur, Putrajaya, Petaling Jaya, Penang and Johor. Luxury properties from key cities around the world including London, Sydney, Melbourne, Gold Coast, Brisbane, Perth and Singapore are also available. The event, which is participated by 80 local and international developers and investment organisations, also features property and investment seminars covering various topics. Property is not just any investment because if the costs spiral, everyone is affected for good – and for bad. HOW many of you all out there want property prices to rise? If you said “yes,” you are probably already highly invested in property, a property developer, a property agent or someone else who has vested interests in property prices rising. If you said “no,” most likely you don’t have a property and aspire to buy one, if not soon, then in the foreseeable future. And you will be in the majority because most people in the country don’t own properties. So let’s establish the first point in our argument: Most people don’t want property prices to rise because they do not own property yet, even if it is just a modest house. But there seems to be a general feeling that rising property prices are good, so much so that some have argued that a multi-billion-ringgit high-speed rail link between Singapore and Kuala Lumpur will be good because it will raise KL property prices by narrowing the differential with Singapore prices. Although it is not clear how such a situation will happen (even with a high-speed rail link, I don’t see anyone living in KL and travelling to Singapore daily or vice-versa), the assumption that higher property prices are generally good for the country is simply not valid. That’s the key point to remember when we encourage foreign investment into the property sector, arguing that Malaysian property prices are relatively low. If enough foreign investors buy the argument, property prices will rise. Yes, some will argue that only high-end property prices will rise because this is the segment that foreigners will be investing in, but there are knock-on effects which will inevitably work their way down into the entire property sector. If high-end property prices rise, Malaysian buyers who would have bought at the old price would be pushed into the next lower tier which would push the prices of that tier up and so on. Eventually property prices will rise across the board – that’s economic certainty. But that does not mean foreign investment in the property sector should not be encouraged. There should probably be substantial restrictions in the residential sector but ownership of office, commercial and industrial properties should be substantially liberalised. There is less likely to be great speculation here because much of the needs will be based on requirements of foreign and local companies here. Therefore, price spirals, bubbles and collapses are likely to be less severe as long as there is some oversight of the rate at which new properties are developed. But it is different for residential properties. One wonders whether foreigners should be allowed to purchase even high-end residential properties. Such moves often price prime quality properties out of the affordable range of locals. Worse, some developers of local properties, especially those with foreign links, actually offer the best space to foreigners first, with these not being made available to locals even if they could pay the asking prices! Developers, of course, have a vested interest in enlarging the pool of people that they can sell too. The greater demand will inevitably raise prices and give them fatter margins. But the cost is that Malaysians have to pay higher prices for these properties and eventually other properties too. Singaporeans have generally been very content with their government for all the development it has brought to them. But they are unhappy with one thing – the high price of quality residential projects because of foreign purchasing which has pushed these properties beyond their affordable level. We really don’t need that here. From a macroeconomic point of view, if one considers the ringgit to be undervalued as many do, liberalising property purchases effectively means that foreigners will be picking up local property at attractive, discount prices. We don’t want to create a property bubble. What we want is movement of property prices reflecting underlying economic trends. Property prices should increase along with the real demand for them, which means actual people living in them and paying for them or the rental for the properties. The recent collapse in property prices around the Petronas twin towers should be an instructive example. When property prices rise because of hype and speculation without real people to occupy them; it’s a matter of time before you have big buildings and no lights at night. And, eventually, fallen prices. As economic prosperity increases, and everyone becomes richer, property prices will increase by themselves and keep pace with the overall increase in incomes. Even as property prices increase, they will still remain affordable. Everyone will be happy but none too much. Like for all other investments, speculative inflow of funds into the property market can lead to unwelcome volatility as well as steep rises in prices followed by steep falls. That’s not good for most people. Managing editor P. Gunasegaram is an interested party – he has property. Malaysian Property Inc (MPI), a government-private sector initiative to woo foreign direct investment (FDI) into local real estate, has set a target of RM20 billion over the next 10 years. Formed late last year, the tie-up will have an initial fund of RM50 million over five years to brand and market Malaysia as an international real estate investment destination. MPI chairman of the board of governors Tan Sri Thong Yaw Hong said the government has provided a grant of RM25 million and the private sector has to match the amount provided. The target markets include the UK, West Asia (including the Middle East, India, Bangladesh, Pakistan), Japan, South Korea, Hong Kong, Singapore and Indonesia. Minister in the Prime Minister's Department Tan Sri Nor Mohamed Yakcop said Malaysia is an attractive destination given that prime properties in the Kuala Lumpur city centre area are tagged at around US$600 (RM2,124) per sq ft compared with US$2,000 (RM7,080) per sq ft in Singapore and Hong Kong. Nor Mohamed, who launched the MPI on behalf of Prime Minister Datuk Seri Najib Razak, added that Malaysian structures should also carry its own local brand identity. Interestingly, FDI in Malaysian real estate at best stood at 2.5 per cent of the value of total properties transacted in the country. This is much lower than other locations in the region where the level is over 30 per cent. Datuk Richard Fong, the chairman of the board of directors of MPI, said that last year, FDI was only some RM200 million. He added the task at hand included the need to dispel certain perceptions about Malaysia, especially in relation to policies on real estate. Since its set-up in December 2008, the MPI team is said to have made headways in organising property fairs in Japan twice, which has led to 30 groups of Japanese investor visiting to view commercial and residential properties. MPI has also taken local real estate developers to the UK thrice this year, which is expected to have another showcase later this year. In order to achieve its goal, MPI has forged strategic alliances with the Ministry of Tourism, The Malaysian Industrial Development Authority (MIDA) and The Malaysia External Trade Development Corp (Matrade). Tan Sri Nor Mohamed Yakcop hitting the gong to mark the launch of MPI. With him (from left) are Datuk Richard Fong and MPI chairman (of the board of governors) Tan Sri Thong Yaw Hong. PETALING JAYA: Malaysia Property Inc (MPI), a joint public-private sector initiative, is aiming to attract foreign investments worth RM20bil in the domestic real estate sector over the next 10 years. The key players in MPI are the Economic Planning Unit, International Real Estate Federation (FIABCI) Malaysian Chapter, Real Estate Housing Developers’ Association (Rehda) and the Malaysian Institute of Estate Agents (MIEA). MPI chairman Datuk Richard Fong said a budget of RM25mil would be set aside by property players in the private sector over the next five years to promote Malaysia as the preferred property investment destination. “The Government has in principle agreed to match this amount contributed by players in the private sector, making the total pool of funds RM50mil,” he told reporters after the official launch of MPI here yesterday. Fong said the funds would be used for promotional activities, including property exhibitions overseas in places like Britain, Hong Kong, Singapore and the Middle East. “We want foreign investors to know more about the competitiveness of Malaysian properties in terms of price, against countries like Singapore and Hong Kong,” he said, adding that Malaysia was likely the only country in this region that allowed foreigners to buy freehold property, besides providing them with exemption from real estate property gains tax. “If you take a residential property in Kuala Lumpur City Centre (KLCC), the price per square foot would be around US$600, against US$2,000 in a comparable residential location in Singapore or Hong Kong,” he noted. Fong said MPI would not only act as a platform to create greater awareness of the attractiveness of Malaysian properties as an investment destination for foreigners but also support and assist the various players in the real estate sector, including providing feedback to the Government. In his speech at MPI’s launching, which was read by Minister in the Prime Minister’s Department Tan Sri Nor Mohamed Yakcop, Prime Minister Datuk Seri Najib Tun Razak said the Government would continue to facilitate investments in the Malaysian real estate sector given its key role in the country’s economy. Najib noted that last year alone, the industry contributed close to RM11bil to the economy, representing a growth of nearly 10%, compared to 2007. MPI would give specific focus on promoting the Malaysia My Second Home programme, in addition to marketing Malaysia as the preferred destination for multinational companies to have their offices here, the premier said. Najib, who is also Finance Minister, said the current investment environment was especially inviting, with no restrictions on domestic funding for foreign investment in local properties, in addition to further deregulation in Foreign Investment Committee guidelines. The Government spending provided for the two stimulus package worth RM67bil would further boost investors’ confidence, he said. The Malaysia Institute of Estate Agents (MIEA) aims to create more recognition for the real estate industry through its annual National Real Estate Annual Awards. MIEA immediate past president and awards chairman Soma Sundram laments that the general public never takes the industry seriously. “People do not see the real estate agency as a serious business, like say architecture or engineering. With the awards, we hope to promote the estate agency practice,” he tells StarBizweek. “We also hope that with this recognition, Malaysians at large will also recognise the good work of estate agents. We feel that they are not appreciated by the public at large. They think we just take people, show house and that’s it,” Soma adds. The MIEA organised its inaugural award on June 26 to highlight the achievements of agencies and its agents in the country for their sales performances in 2008. A total of seven award categories were contested. Only active members of the MIEA were allowed to participate. Soma says the idea of an award to recognise the achievements of real estate players was thought of 15 years ago. Being the first of its kind, Soma admits there will always be room for improvement in organising such an event like the National Real Estate Awards. “We expect even greater competition next year and I’m sure even the judging standards will be raised,” he says. This year’s inaugural awards was judged by an independent committee headed by International Real Estate Federation (FIABCI). On another note, Soma says he is optimistic about the outlook for the local property industry despite the current global economic downturn. Newly appointed MIEA president Julie Wong shares Soma’s sentiments. “Affected properties are mainly those within the Golden Triangle area whereby 30% are bought by foreigners. When the economy in their own country is affected, they panic and start to sell from here. “There is a little bit of impact within the Mont’ Kiara area because there are a lot of foreigners there too. Other than that, we have not heard of people who were desperate to sell off their commercial properties or condominiums,” she says. Soma says the situation is also far from dire for the real estate industry. Wong adds that the real estate industry has become wiser since the 1997 Asian financial crisis and is more prepared to handle the current economic downturn. The unprecedented hard times brought on by the global financial crisis still have some way to go before countries around the world can look forward to better days ahead. Having succumbed to major losses in their export income, current accounts and investment values, these countries will be vying for a quicker recovery and are making efforts to shore up their “magnetism” to be among the first in line to attract more foreign direct investment (FDI) to their shores. Hopefully Malaysia’s recent economic liberalisation measures will place the country on a more equitable footing to vie for a share of the FDI pie. Although the lifting of the 30% bumiputra equity ruling for initial public offerings and the removal of the Foreign Investment Committee’s guidelines on equity acquisitions, mergers and takeovers, would certainly give a boost to the country’s image in the international front, more public and private sector initiatives to ensure the latest government measures are clearly communicated to the global business community are necessary. If the liberalisation measures are expediently and efficiently implemented and the new liberalised environment is encouraged to flourish, they will provide a strong foundation for Malaysia to attract more local and foreign interest to set up business operations and regional hubs. Malaysia stands a good chance to emerge as a stronger economy and to actively partake in the emergence of a new world economic order after the tumultous weather of the global crisis. The global financial crisis has exposed a severe weakness in the present system and there is a need for a dramatic change in the global financial regulations, particularly in the United States, Britain and other developed economies. In the coming years, global growth will be compromised by the disappointing performance of the developed economies. The consolation is that Asia stands a chance to bounce back stronger than ever before. Economists expect Asia’s capital markets to emerge stronger through greater integration of its markets, progressive liberalisation and supportive national regulatory frameworks. In this regard, Malaysia is also doing its part to stay competitive and has seen major liberalisation in its financial sector in recent months, aimed at enhancing competitiveness in its financial landscape as well as increasing foreign investors’ participation in its capital market. Singapore and Hong Kong’s stature as regional financial centres and their attractive foreign investment and tax incentives are among the factors cited for their popularity as hotspots for high net worth foreigners to set up businesses and second homes. Of course their cosmopolitan lifestyles and world-class infrastructure, especially the highly integrated, easily acessible and affordable public transport system, make people from many parts of the world feel at home. One of the top marks given to Singapore is for the safety and orderliness of the city state. It is also recognised as one of the cleanest and greenest cities in the world. Singapore has done very well in the real estate sector and successfully attracted many high net-worth investors to set up homes. Among the Who’s Who in the celebrity circuit that own homes in the city state include famous Hong Kong movie stars Jet Li and Jacky Chan. Some 25% of Singapore’s property were sold to foreigners in the last few years. Malaysia’s property sales to foreigners only made up 3% of the total RM2.5bil industry sales last year. To leverage on the Government’s liberalised measures for the property market, Malaysia should further harness its potential as a real estate investment destination by having concerted plans and programmes to attract high net worth investors to set up businesses and homes. The initiatives by the Malaysia Property Inc (MPI), a joint public-private sector initiative officiated by Minister in the Prime Minister’s Department Tan Sri Nor Mohamed Yakcop yesterday, is a commendable effort to promote Malaysia as an international real estate destination. If MPI’s target to attract RM20bil in foreign real estate investment over the next 10 years can be achieved, Kuala Lumpur and Penang (the two favourite destinations for Malaysia My Second Home participants) should well be on their way to make it to the rankings of global cities. There should also be potential for the other cities to get into the radar of these foreign investors. MPI should ramp up its overseas roadshows and programmes in the coming months to the potential markets. Its primary target markets include Singapore, Britain, Japan, Hong Kong, Indonesia and the Gulf Cooperation Council countries, while the secondary markets are China, India, Pakistan and Bangladesh. But to ensure MPI’s “seed planting” efforts bear the desired fruits, it will be necessary for Malaysia’s quality of life index, in terms of personal safety and security, and superior public transport system, to be placed as among the top agenda by the respective governing authorities and the private sector. This will be the start of many more new initiatives needed to set the country on its path for greater visibility in the post-crisis new global economic order. Deputy news editor Angie Ng feels that the chaos and impoverishment caused by the global financial upheavals are good reasons for the people to go back to the basics of simplicity and inculcate more humanity and kindness for each other. SINGAPORE: Singapore’s private home prices fell 4.7 per cent last quarter, less than earlier estimated, as signs the economy was emerging from recession encouraged home sales last month. The price index of private residential property declined to 133.3 from 139.9 in the previous three months, the Urban Redevelopment Authority said in a statement on its website yesterday. The agency had forecast on July 1 that prices dropped 5.9 per cent.